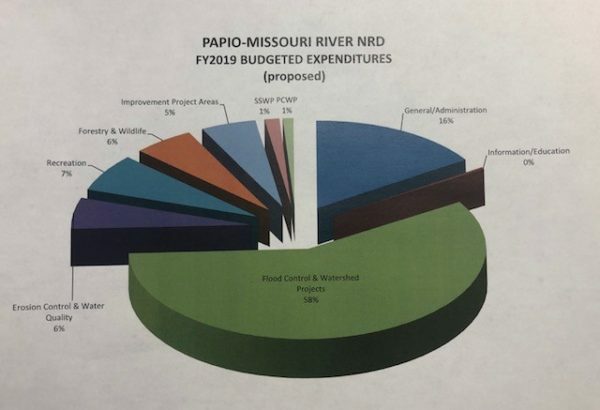 Omaha, NE: At its September 13th meeting in Dakota City, the Papio-Missouri River Natural Resources District Board of Directors voted to approve the Fiscal Year 2019 general operating budget that includes a decrease in the Papio NRD property tax levy. “We are proud the District’s property tax levy will decrease again this year,” said John Winkler, general manager of the Papio NRD. “For 13 out of 14 years, the District has either decreased or kept the tax levy the same. We work diligently to save local taxpayers millions of dollars and take seriously our responsibility in doing so in a transparent manner.” said Winkler. The FY 2019 budget calls for a property tax levy of .037594 per $100 of assessed valuation, which means a homeowner with property valued at $100,000 would pay a total of $37.59 in property taxes next year to support NRD projects. The budget calls for an estimated $24 million in revenue from the NRD’s property tax levy. The total operating budget is estimated at $72.2 million. The Papio-Missouri River NRD’s property tax levy amounts to less than two percent of the total property tax bill for residents living within the District’s six-county area. The levy is based on an estimated 5.2 percent increase in valuations across the district, which includes all of Sarpy, Douglas, Washington and Dakota counties, plus the eastern 60% of Burt and Thurston counties. In the District’s continuing efforts to enhance transparency, responsiveness to its constituents, and to educate stakeholders and the general public about the intricacies of the budgeting process, John Winkler, general manager of the Papio NRD, reviewed and provided the following feedback on the Nebraska Taxpayers for Freedom’s (NTF) Issue Paper. After a more detailed review of the “findings” of the NTF analysis management thought it prudent to directly respond and correct some of the inaccuracies and misconceptions the issue paper contains. I for one very much appreciate the input the District receives not only on the budget but any project or program we undertake. The District consistently strives to be the most transparent, responsible and responsive government entity not only in the State of Nebraska but in the entire country. In order to achieve these lofty goals it is incumbent upon the District to ensure accurate information is presented at all times. Furthermore, in the future we will seek to establish additional proactive strategies to educate the public in not only general public budgeting process but the internal budgeting processes of the District as well. One of the “criticisms” of the NTF analysis is the District “over budgets” revenue every year and over spends on items outside of its CORE responsibility. Fact: The NRD has 12 statutory CORE Missions given to it by the Nebraska Legislature. These CORE missions are broad and encompassing to protect life, property, wildlife, the environment, the economy, our natural resources and the very future of our communities. Every District project and program is authorized and funded by an elected Board of Directors and has a direct link to the agencies 12 CORE missions and statutory responsibilities. The District historically does not spend all of the funds allocated in the annual budget. There are several factors that impact the expenditure of funds any given year. A great majority of District projects and programs are multi-year efforts and are reliant upon factors outside of the Districts control. For example, District projects and programs often experience weather delays, delays in securing state and federal permits, delays caused by utilities or other conflicts, delays caused by partner agencies and many other unforeseen events can delay the completion of projects which ultimately delays the expenditure of funds. One of the most perplexing NTF criticisms is the District’s cash on hand is too large and fuels increases in the budget and an increase in property taxation. Fact: These statements could not be more inaccurate and are possibly generated by a general lack of understanding of the budgeting process and public financing. The cash on hand at the end of each fiscal year does not contribute to increased budgets or increases in taxes, actually it is quite the opposite. Any cash on hand from the previous budget year is transferred to the next budget year to be utilized as a beginning balance, before tax requirement are calculated, for those projects and programs that did not get completed the prior fiscal year. In fact the project reserve fund actually contributes to a reduction in the required property tax requirement as these funds are the first to be budgeted/allocated in the budget process. Simply, the unused funds are carried over from one fiscal year to the next and utilized as a baseline in the next budget; the budget doesn’t start from zero, especially in light of the fact that many District projects take years to construct. It is stated in the NTF analysis that 33.8 million was over budgeted from last fiscal year and only 55% utilized. Obviously, when the District budget funds for a project or program it expects to expend those funds that fiscal year, however, due to the delays pointed out earlier many projects get delayed from one year to the next. Once again, this unused revenue funds are carried over to the next fiscal year as a beginning balance for that project or program which did not get completed and many times no additional new revenue is needed. The NTF indicated that the NRD spent 110.9% of property tax budgeted from General Fund an “embarrassing amount”. Fact: These funds are not property tax funds but is revenue generated through lease payments, fees, donations, and other miscellaneous revenue. In fact these funds assist in reducing the property tax requirements of District taxpayers and the District has done an outstanding job maintaining and increasing revenue streams from leases, camping fees, user fees etc. Another fact is the District only collected 83.5% of anticipated revenue due to delays in project completion or progress. As only one third of the District’s total revenue is property taxes the District does an extremely commendable job securing additional revenue streams that greatly limit the property tax requirements of District constituents. The NTF analysis called out two expense accounts that were over budget and others that were “woefully” under budget, which in their opinion pointed to “poor budgeting”. Fact: The two expense accounts over 100% of the budget were projects that were ahead of schedule and additional work was able to be completed in the fiscal year which not only adds increased value to those we serve but saves money by completing the project earlier. The NTF analysis identifies the 5% health insurance premium increase as a need for employees to pay more of their health insurance costs. Fact: The NRD health plan is a self-funded plan administered by the NRD’s and its Directors and employees. The NRD health plan has experienced record low increases in health insurance premiums over the last 7 years and is anywhere from 30 to 50 percent below market premium increases compared to other health insurance plans each and every year. I am a member of the NARD Benefits Committee and steps are taken consistently to keep premium costs down and to spread any increases to employees and employer. The committee recently raised the prescription drug co-pays for employees and is looking at other plan modifications to save money. This health insurance plan has been a huge savings to the taxpayers of the District compared to other entities. The NTF analysis indicated that several line items under Special Planning/Engineering/Recycling are not defined clearly. Fact: All Special Planning/Engineering/Recycling are clearly designated on page 5 and 43 of the budget. Our budget worksheets are one of the most detailed and transparent budgeting documents in the State of Nebraska. The NTF analysis identifies “identical amounts” for office carpeting and office painting appear in the last fiscal year, so these expense carryovers boost the property tax requirement. Fact: As discussed earlier carryover funds do not boost property tax requirements and these funds were carried over because the leases with USDA, NRCS, FSA and the Corps of Engineers were being reviewed for work space requirements and thus the lease not finalized. In fact, the District will be receiving increase lease fees and internal work efficiencies by utilizing current space more efficiently and effectively thus saving even more taxpayer money. The NTF analysis assumes the cash on hand funds and operating reserve boost the property tax load and resembles “a slush fund”. Fact: The operating reserve is less than one month of District operating expenses and is woefully underfunded compared to similar operating reserve funds like the City of Omaha, Douglas County, State of Nebraska and every school district in the State of Nebraska. Like any “rainy day” fund the operating reserve should contain 3 to 6 months of operating expenses. The other assumptions of cash on hand and carryover funds has been explained. The NTF analysis states the Southern Sarpy Watershed Partnership continually shows a bloated reserve. Fact: The SSWP has a large cash balance because of private development fees that have been collected by the SSWP partners and distributed to the District. The majority of these funds were paid by the new Facebook Data Center. The collection of these private fees further reduces the burden on the District taxpayers. The NTF analysis states there is not “justification” for the $500,000 for the USACE Papillion Creek Watershed re-study. Fact: The USACE re-study is a 50-50 cost share federal study of the Papillion Creek Watershed which upon completion could open the door to tens of millions of dollars of federal funding to complete the Papillion Creek Watershed Plan. The study was discussed multiple times and approved by the NRD Board of Directors at a public meeting and was extensively covered in the media and at past Board meetings. The NTF analysis states the information support programs “over budgeted” the last fiscal year. Fact: Information support programs were not completed last fiscal year due to the retirement of Emmett Eger, Program Manager, and the subsequent hiring of a new Program Manager and other department personnel. These unused funds were carried over into this year’s budget and will be redirected to new and updated information and education programs. The NTF analysis states the Omaha Levee Certification and Western Sarpy Clear Creek was “over budgeted”. Fact: The City of Omaha Levee Certification is authorized and budgeted for $500,000 a year up to a total of $2,000,000 maximum District contribution. Omaha simply did not spend the full $500,000 budgeted last fiscal year as they were unable to complete as much work as they wanted and thus they were not able to request the full reimbursement from the NRD. Therefore, $500,000 is budgeted again this fiscal year and the unspent funds are rolled over into the next fiscal year and all of the maximums remain in place. It was anticipated the NRD would need to reimburse the Corps of Engineers $700,000 for the Western Sarpy Clear Creek Levee Project expenses, however, due to NRD staff’s professional relationships and competent negotiation skills the $700,000 payment was not required. Consequently, this saved the taxpayers of the District $700,000 in property tax funds. The NTF analysis was “disturbed” that funds were budgeted for Flanagan Lake so soon after completion. Fact: Flanagan Lake was recently completed and opened in July of 2018, however, due to the amount of precipitation and extreme rain events that occurred this year some of the seeding and other erosion control measures didn’t have time to properly establish, consequently, those erosion issues must be addressed to properly protect the public from danger and the structure from further damage. The NTF analysis questioned the budgeting of funds to dredge an SID Lake. Fact: The NRD has an established program that was approved and funded by the Board of Directors to allow municipalities including SID’s to apply for cost share funds to dredge small Water Quality Basins. These Water Quality Basins protect main stem flood control reservoirs from silt and pollutants. The continued functionality of Water Quality Basins will ultimately save the taxpayer money as the main stem reservoirs will not need as much future maintenance. The NTF analysis was disappointed in the amount of state grants that were or weren’t collected the last fiscal year. Fact: Since the NRD just received federal permits on a number of large projects, now work can begin to construct those projects. State grant funds are only reimbursed to the District when qualified and eligible project costs are performed and those costs are incurred by the District. State grant funds are held by the state until the work is completed, the state is invoiced and the work is verified as being completed by the state. No state funds were lost, the work and reimbursement is simply delayed. The NTF analysis believes the construction bid on the new equipment shed is too expensive. Fact: A competitive bid was solicited on the equipment shed and the Board of Directors approved the lowest and best bid. This shed will ultimately save the taxpayers of the District money and it will protect District equipment and extend the life of that equipment. The NTF analysis identifies that developer fees collected in the PCWP are not meeting estimates from nine years ago. Fact: PCWP development fees have lagged from original estimates, however, fees are starting to increase over the last few fiscal years as the housing market booms and development races forward. Development fees will be addressed in the upcoming five year PCWP Plan update. The District appreciates the positive points outlined in the NTF Issue Paper and will review and take under advisement the NTF suggestions. Perhaps in the future District staff can engage the NTF to discuss public budgeting and the internal NRD budgeting process in greater detail. I believe a lot of these concerns are based on misinformation, a general disagreement or opposition to District projects like reservoir construction or a general lack of understanding of NRD budgeting processes and techniques.